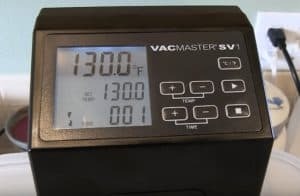 The VacMaster SV1 Sous Vide is a high quality Commercial Grade that's extremely powerful and is especially good at heating large quantities of water. All of this high quality and power come at a premium price, this model is about double the price of our highest rated sous vide model the Anova Bluetooth Sous Vide. $220.99 Current Price - YOU SAVE $123.31. This model has 1500 Watt heating element which was the highest of all the models we reviewed. It can also heat up to 8 Gallons of water, which was also the highest capacity of all the models we reviewed. If you have to cook large bulky foods in high volumes of water this model should definitely be on your short list. The design and control panel for this unit work but definitely feel dated when compared to other models. This model is 12.5" in height it has a standard strength housing and a stainless steel housing for the heating unit. 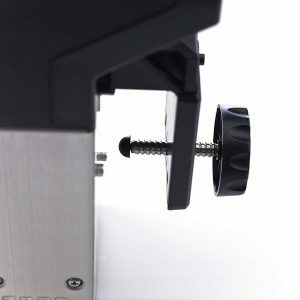 It has an adjustable clamp that allows you adjust the position both horizontally and vertically, this is the most flexible configuration you can have. This model puts out 1500 watts of power, which is higher than the average for the models we reviewed. It has a flow rate of 1.2 GPM, which is higher than 2.0 GPM average for the models we reviewed. This high power and high flow rate on this model means you will have to be much more vigilant about the water level on extended time cooking projects. The high power and flow rate of this model means it will reach your set temperature a lot more quickly than most models. We liked this model a lot for its quality workmanship, high power, and ability to heat a large volume of water. At $220.99 it's a lot more expensive than other models. If you need a higher-quality product, need to cook large foods in large cooking vessels keep this model in mind, if you don't look at the Anova Bluetooth Sous Vide which is a much better value for your money. 12.5" x 5.5" x 3" 7.9" x 4.4" x 4.1" 14.2" x 3.9" x 7.4"
The VacMaster SV1 Sous Vide is a high quality commercial grade sous vide precision cooker that has high heating capacity.